The Quoizel Kami traditional floral 3 light Tiffany ceiling pendant, part of a stunning collection featuring a floral design set in an Art Nouveau pattern, handmade using high quality art glass and hand soldered using traditional techniques. 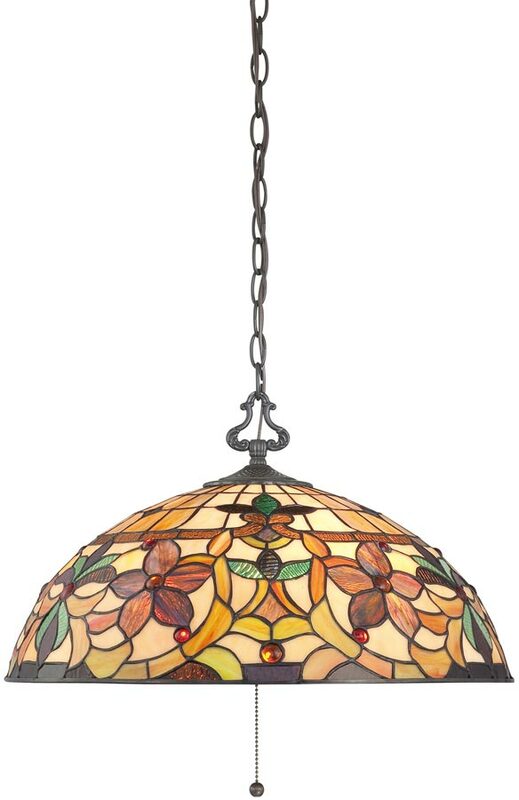 A good sized three light traditional Tiffany ceiling pendant, with a detailed ceiling mount and chain suspension finished in vintage bronze. The wonderful hand-crafted Tiffany pendant shade contains 360 separate pieces of high quality art glass and features scenes depicting flowers, leaves and berries in shades of caramel, amber, emerald green and ginger. The floral scenes are set within a classic flowing Art Nouveau pattern. The range and warmth of colours ceates a harmonious balance of light, whilst the amber rippled glass highlights and jeweled berries will create contrast and spakle like jewels when illuminated. Fitted with a pull chain on/off switch that hangs beneath the shade for convenience and style. Supplied with 150cm of chain that can be shortened by removing links at the time of installation. Minimum height 40cm, maximum drop 210cm. Supplied by Elstead lighting and designed by Quoizel, founded in 1930 in New York. 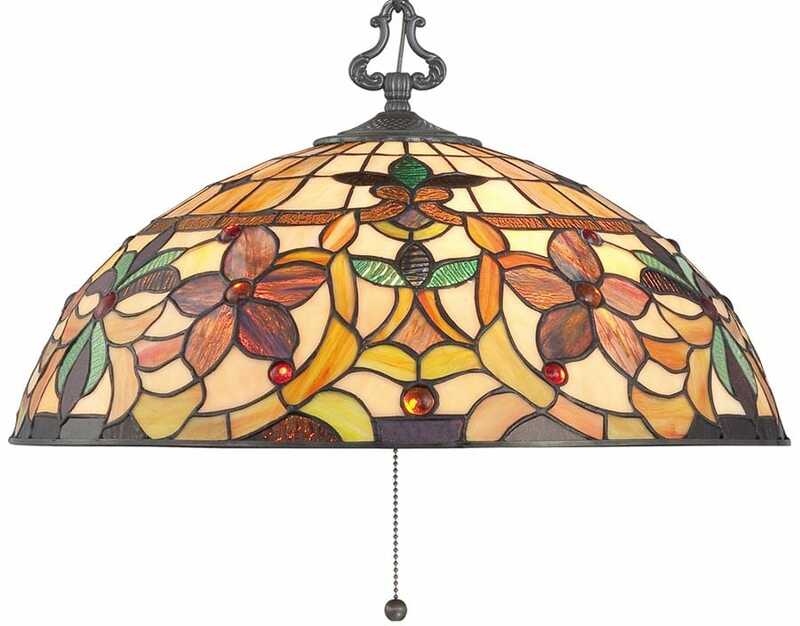 Quoizel products are now being introduced to the UK market and have quickly built a reputation for their diverse, unique and fresh designs such as the Kami traditional floral 3 light Tiffany ceiling pendant you see here.